Wario Death is such a typical “failure state” in platformers that it’s hard to imagine one without. Yet, for Wario Land 3, this absence makes it one of the most innovative platformers you can play, even two decades after its release. Death is the defacto platformer “failure state”, as you reset at the previous checkpoint to have another go. In Wario Land 3, this is removed entirely. Instead, enemies will stun you or give some status condition that may set you back. If you fall off a platform, or get sucked into a bubble, you will find yourself having to attempt a small section over again. The enemy effects are also funny! Wario finds himself being turned into a zombie (must find a light to turn back) or swelling up as an allergic reaction (floating up until he hits a solid object). The varied effects bring something new to almost every level. Better yet, the player keeps some control. 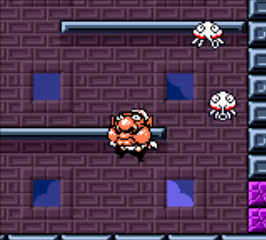 They may guide their dizzy Wario as he stumbles, or continue making progress in the level while Wario is on fire! Getting hit by enemies does not interrupt play, but adds to it. A few games have dabbled with “no failure state”, such as TT’s LEGO games, or Kirby’s Epic Yarn. In these, a death means no progress is lost whatsoever. 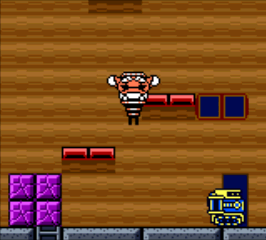 However, in Wario Land 3, the levels loop in ways to capture players’ mistakes safely. There is a “failure state”, but it isn’t death. To give a simple example, many of the platformer sections have pits to fall in. 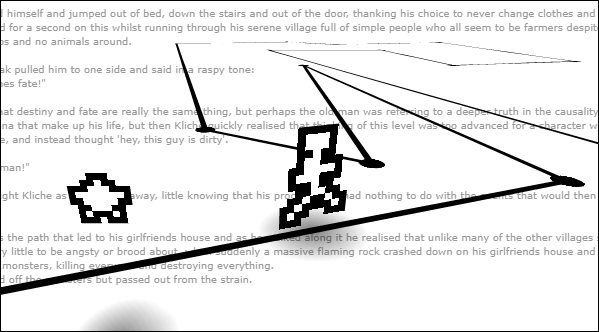 The player runs back to a ladder, and climbs up to the starting position. This format is used in many ways; for example as Wario tries to make his way down through a swimming section and must avoid bubbles that return him to the surface. 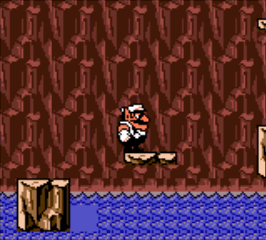 Many levels rely on one gimmick, such as a water current that will take Wario to the start if he falls in. Pictured is a clever “break” in this current, giving a mid-level checkpoint to ensure that challenges don’t become too frustrating. None of this couldn’t be done with traditional “death and checkpoint” mechanics, but keeping the player alive ensures there is never a break in the flow. The transformations are regularly used as puzzles, taking advantage of how they all play differently. 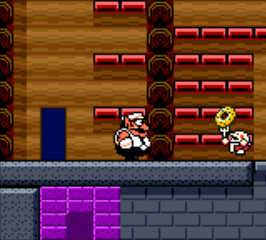 Pictured is ‘Fat Wario’ and a little donut-throwing enemy. In some levels, fatness slows you down as your jumps shake the earth. 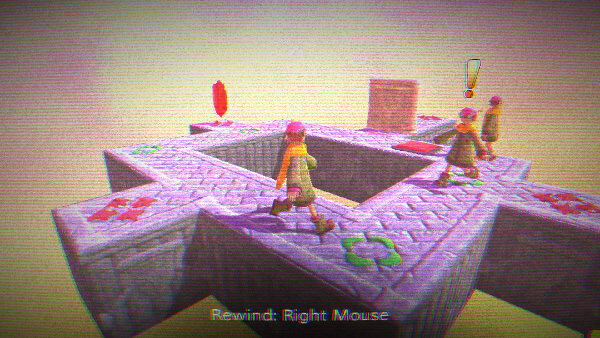 However, here you need to use your earth shaking to get the donut chef to bounce up the platforms on the right! It’s a clever puzzle, and the sheer number of different effects allow for many of these moments. Perhaps you need to use the zombie to fall through the floor, or get turned into a spring to bounce to a high place? Wario Land 3 is one of the best games on the Gameboy Colour, and I’m surprised that the no-death concept hasn’t become a regular feature. Perhaps the best lesson to take from this game is that nothing is sacred in your favourite genre – it could even lead to new innovations. Superhot took the FPS genre and slowed it down so you can plan your actions, while Snake Pass is a 3D platformer with no jump button. What about a dungeon crawler where you aren’t trying to kill enemies, or a fighting game where the characters don’t take damage? If nothing else, push boundaries. Hot on the heels of his early access launch of MoonQuest, I got the chance to speak to Ben Porter about its creation. He has written about the somewhat arduous 7 year journey, involving Kickstarter and numerous extra activities on the way. At last, the game is out, though Ben isn’t done finished with the project just yet. Congratulations on the launch of your game! What were the biggest inspirations going in to MoonQuest? Ben: Thanks! Minecraft, Nethack, Terraria, and Spelunky are the biggest inspirations for the game, and I like to feel like I’ve absorbed some goodness from each. 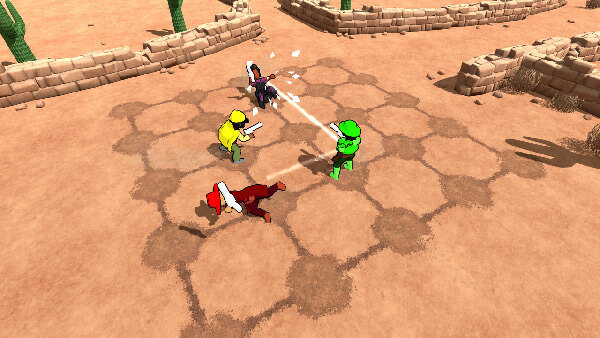 With that said, MoonQuest actively tries to be its own thing, and doesn’t really fit the genres of any of those games. My earliest ideas for some of the things in MoonQuest go back decades, to when I was a child, designing how a character in a game might have different armours, weapons, etc. You’ve written about the extended dev period dating back 7 years. Given a time-travelling email server, what advice would you give yourself 7 years ago? B: I’d definitely send myself the article, but in addition I’d tell myself to be wary of having two competing motivations: learning how to make a game from scratch, and making a great game. I would tell my past self to just do one or the other. I’d probably also tell my 2011 self that the new engine on the block, Unity, would become the defacto game engine for independent developers and that I should try to ship a commercial game in that first. You’ve made all sorts of other projects, from Twitter toys to game jam entries. Have these changed your development process at all for major projects? B: All my little projects feed back into my development. I’ve written a standalone dialogue generator, for instance, that I incorporated into MoonQuest, and now the NPCs all say random phrases. Design-wise I think all those prototypes and side-projects definitely influence the ideas I have for future games — all typically of a procedurally-generated nature. You also created @Pixel_Dailies, where artists are challenged to make pixel art to a theme. Going back to old videos, it’s clear that MoonQuest’s art has come a very long way – are Pixel Dailies the reason? B: It took years to figure out the basic MoonQuest style because I was a fairly novice artist. I started Pixel Dailies to improve, and I think it helped dramatically with MoonQuest. However, the main reason MoonQuest has improved is because of the work of two artists: G. P. Lackey, who did some amazing concept art and designed the style upgrade post-Kickstarter, and Alex McDonald, who has been solidly working on the game since around 2014, creating everything from the backgrounds, animations, character portraits, promotional art, and so on. 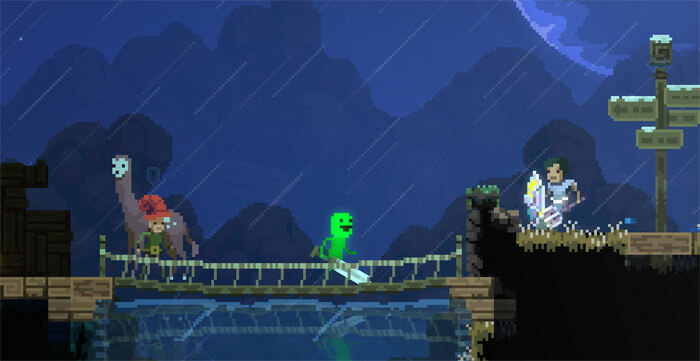 I can’t overstate how much that MoonQuest is a collaborative effort. What did you get right or wrong about the Kickstarter? B: The Kickstarter was instrumental in producing MoonQuest, and without its success I would have had to release a very buggy and incomplete game into Early Access. The experience was 99% positive. The 1% badness was the fulfilment of the t-shirt backer rewards, which ended up being a nightmare due to reoccurring printing issues. I think the Kickstarter was successful primarily because of the many people who already knew about and supported the game — it was their enthusiasm that helped drive the publicity of it to help me reach the goal. Did you get any advantages from coding everything yourself, down to the basic game engine? B: In theory, the advantage I have is that I can fix, optimise, or reengineer any part of the system to suit my game. If I wanted to distribute it on another architecture, I could (again in theory), port all the code myself. However, the benefits of building your own engine have dramatically declined over the last decade. Unity, Unreal Engine, and Game Maker have become more powerful, cheaper, and more widely-used. Building your own engine these days is worthwhile if your game is relatively simple, if you’re an expert, or if your game does something substantially different (e.g., is based on some new rendering technology). My advice to anyone starting development on a new game: just use a commercial engine. Finally, is Moonman ever seen without his glowing smile? B: Some say his face is just painted on. Thanks a lot to Ben for the chat! MoonQuest is out now in all good Steam libraries. Or find @eigenbom on Twitter and change his icon. I’ve really enjoyed putting achievements in games, and well designed ones can get a great response from players. There’s a dark art to making them both fun and compelling, rather than a forgettable chore. So, here are the lessons I have learned in list-orial format. 7. Give one for something really, really easy. This A) lets players know that this game has achievements and how they’ll be delivered, and B) gives a little positive feedback for them helpfully opening the game/trying the first level. If you think super simple achievements are silly, then you could always give it a sarcastic name. 6. Understand the effects of achievements. For most players, they give a small endorphin kick and increase engagement. They can provide a reason for exploring, or returning to parts of the game to dive deeper. They can even function as status symbols, where only 0.1% of your players are worthy of an achievement. 5. Understand the negative effects of achievements. 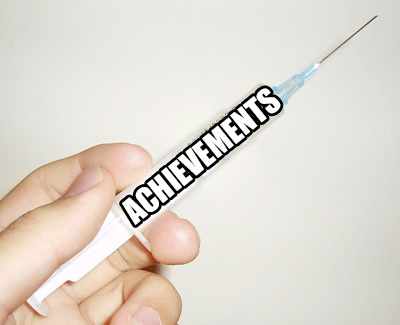 A segment of your player base will gun for achievements like meth addicts. Players may be stuck in parts of your game far longer than they are having fun, because the reward mechanic is stronger than their self-control. As a dev, it is your responsibility to make the achievements a fun addition, rather than a way to force player behaviours. 4. Space set piece achievements wisely. Far too many games give an easy achievement, and then nothing else until the credits – the rest are tied into completionist challenges or absurd coincidence. I would strongly suggest having progress achievements regularly spaced through the campaign. Many games are divided into “chapters” or “worlds” that make this a no-brainer. 3. Preserve some mystery. I like having suggestive titles that don’t explicitly say an achievement’s requirements, but still give enough to let the player guess. When it has been finished, more information can be available describing the achievement’s exact conditions. 2. Make a joke! Not every achievement needs to be serious or particularly difficult. Great examples include “That Guy” from Move or Die after annoyingly running into other players, or even better, the “Click On Door 430 Five Times” routine from The Stanley Parable. 1. Tie in gameplay effects. An achievement system that gives a reward that can be spent in-game will have players caring far more about it. This brings achievements into part of the core gameplay loop, which in the right game is extremely powerful. With that, “achievements” doesn’t look like a real word any more. Develop responsibly! I had the opportunity to speak to Sophie Houlden, who is a vibrant member of the developer community, with a mountain of games spanning over a decade. Her projects include Rose & Time, Bang Bang Bang, as well as over 40 (!) smaller projects/jam games. Of your numerous games, which came closest to the vision you had going in? Sophie: Probably “The Linear RPG“, I had some concept sketches I made and the result looks pretty close. I think the reason is because of the scale, bigger games tend to stray further from an original idea just because I spend more time on them, the idea is going to grow and evolve over time. I think that’s fine to be honest, there’s nothing inherently better about the very first image of a game I get in my head – it’s important to let that develop (or cut away from it – a great idea that is never finished is only ever an idea). I really liked The Linear RPG – it’s good to sometimes make a small game that starts as one joke. Is humour important when you’re working on a project? How important are game jams in your creative process? S: It varies a lot, sometimes I’ll make a game in a jam and then I’ll build on it and release something more robust/polished/bigger – it can be a good way to get a project started quickly without getting caught up in minutiae that I would otherwise worry about. A jam game skips a bunch of early work and either it works or it doesn’t, you’re forced to make all the big decisions early and once the jam is over then what a more polished version needs is apparent, it’s harder to get trapped in hypothetical, “if I do this am I committed to the game being XYZ and not ABC”. On the other hand, game jams are often exhausting and I can’t really do them as reliably as I could a decade ago. When I’m doing new projects, I tend to start in a jam-like mindset once I have the energy myself – rather than waiting for a jam and hoping I happen to be healthy and energetic on that jam’s particular weekend/week/month/whatever. You’ve been creating games for a long time, now. At what point were you able to become a full-time indie developer? S: At no point really, and if any, then only in the last year as I got my Patreon set up. I’ve been losing money and having debts grow for a long time, and I still owe a lot of money. I’m only now with the support of my patrons in this ‘neutral’ position where I can just about afford to eat and stay at home without my debt increasing. Has your process changed much after moving from Flash to Unity? S: When I first moved from Flash to Unity, the two were actually very similar, at least for how I worked. Although Unity has grown and changed quite a bit over the years so I guess my process has changed along with it? The foundation stuff is always the same though; you get an idea, you experiment with it, and if you think it’s good enough and worthwhile then you grind away at it until it’s done or until you can’t work anymore. What advice would you give to a new developer starting out today? S: Accept that you’re not going to make money, if you still want to do it then get stuck in and find stuff that you enjoy working on. If you’re not happy then find something else, that could be a different tool, maybe a different workflow, different kind of project, or maybe something besides games. I think if I did nothing but games I’d have destroyed myself a lot more. What do you mean by destroying yourself? S: My point being that working on games is tough, and sometimes it’s really tough. Gotta take breaks or be broken. For you, is making games a means to an end, or an end in itself? S: Both (again, it depends on the game). Sometimes I make a game because I think it is a game that should exist and so I’ll make it happen, sometimes I make a game because I need something to work on that I enjoy working on, like it’s a little puzzle for me to solve. If you’re asking if I’m making games as a way to accomplish some other thing in my life; not really. I just make games because I’m someone who makes games. Thanks so much for the insights! Sophie is doing monthly builds on her Patreon, and releasing “ducksnakes” daily on Twitter.